West :- Danapur Cantt. Area to Danapur Railway Station, Khagaul along Danapur-Khagaul Road and adjoining areas upto 500 Metre. East :- Upto the Sabalpur along Patna Bypass Road and adjoining area upto the Beur, Patna area. South :- Anishabad-Janipur Road including Phulwarishariff and along AIIMS-Khagaul Road upto the Khagaul and adjoining area. The serving Central Government Employees residing outside the CGHS covered areas shall be covered under CS(MA) Rules. 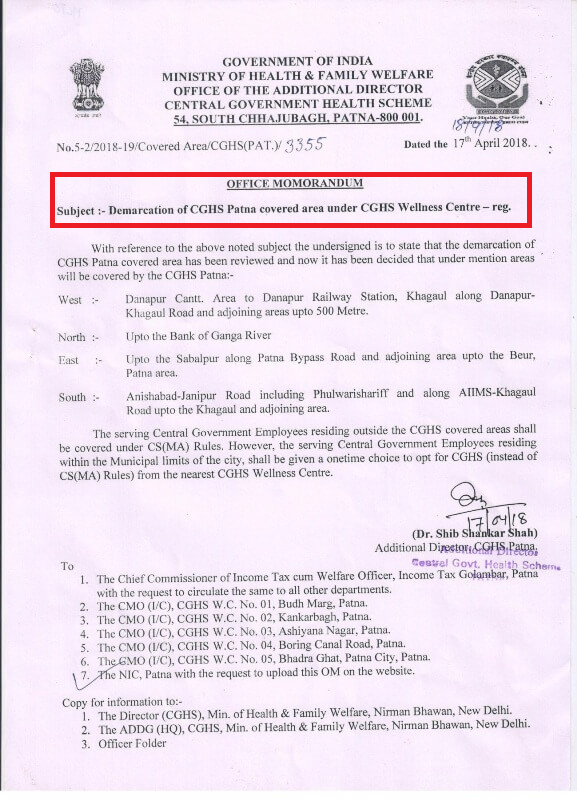 However, the serving Central Government Employees residing within the Municipal limits of the city, shall be given a onetime choice to opt for CGHS (instead of CS(MA) Rules) from the nearest CGHS Wellness Centre.